What They Expect Coast to Coast and Everywhere In Between! Customer service and sales professionals – are you aware of the regional differences across America that impact your service and sales success? You travel the world through your phone and computer. You take that journey every time you interact with a customer, even face-to-face. Do you understand how USA customers’ expectations differ coast to coast and everywhere in between? This unique training DVD will tell you. Do you know how to deliver memorable personalized service to someone in New York City? Could you truly satisfy a customer in the deep South? What do you know about getting Texans to trust your customer service? Do you understand the Midwest people enough to gain them as loyal customers? When you understand and adapt to regional differences in customer expectations, you make it easier for your customers to do business with you no matter where they are. You may be a global corporation but your customers want you to act local! 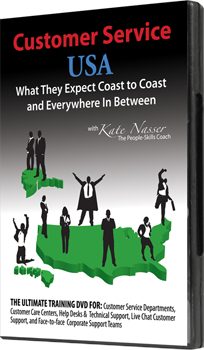 In this info-packed and humorous training DVD, Kate Nasser, The People Skills Coach™, builds your skills in adapting to customers’ regional expectations throughout the USA. Your business success depends on gaining their loyalty. Customers don’t want a scripted generic answer that they could read on a website. To distinguish your service, personalize it! Download Customer Service USA Training DVD Product Info Sheet. This training DVD has high value for Customer Service Centers, Customer Care Teams, IT Technical Support, Live Web Chat Support, and Face-to-face Corporate Support Teams. –Drew Schmoll, Customer Service Rep. Filled with true stories, this training DVD creates lasting images that make the information and techniques easy to remember. Teams remember Kate’s “Slice and A Coke” story as a quick reminder on how to deliver great customer service in NYC. Who could possibly forget her nationwide travel stories to the Deep South, the Midwest, Texas, and the Northeast, that gave her the regional insights for this DVD? Kate Nasser’s coaching techniques completely shatter the training seminar myth. This training DVD captures her energy and your staff will honestly believe she is in the room with them. The training DVD has two chapters (45 min. each). Total play time-90 min.